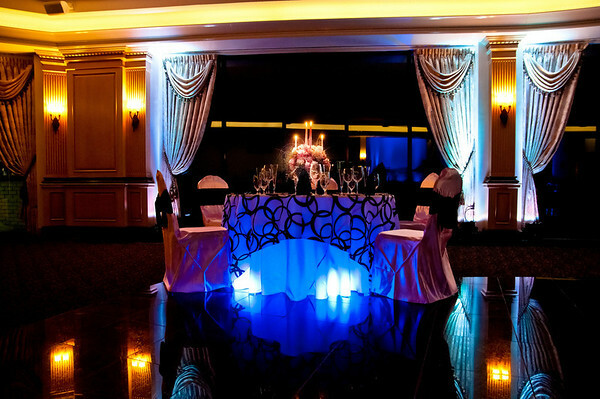 Every reception hall has certain characteristics that assist the photographer in creating unique images during a wedding reception or other event. 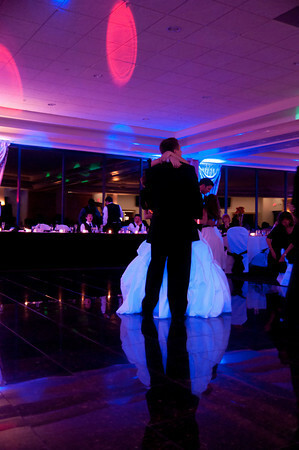 The Club at Shadow Lakes in Aliquippa, PA has a beautiful, reflective dance floor. In the first photograph of the bride and groom's first dance, I utilized the special lighting by Uplighting specialist (DJ) Frank Gloor of Otto Productions to create a very unique and interesting photograph of the couple's first dance. The unique blend of colors created a beautiful mirrored image of the couple as they danced in perfect harmony to their song. As they looked into each other's eyes, I am sure they were not thinking about the beauty of the lighting or the reflections of the floor. No doubt the groom was mesmerized by the beauty of his bride and gazed endlessly into her eyes. Although the guest were talking in the background, their voices where muffled compared to the sound of each other's heart in their ears. In the first photo, there was no flash or extra lighting used except what was provided by Otto Productions. Notice how beautiful all of the colors look not only in the reflections in the floor but also along the windows and ceiling. In the second photo, I utilized not only the lights from Otto Productions but we also back-lit the bride and groom utilizing a wireless flash and video lights. 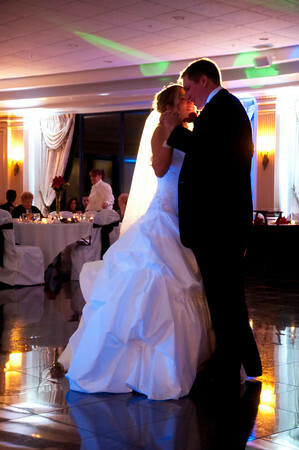 This lighting set-up created the glow and highlights surrounding the couple. Book dr Frank to photograph your wedding.